Alan Hagg, of Paul Alan Yacht Consultants Middle East, tells me, that while several websites have reported the sale of the 64.6m Van Triumph, this is definitely not the case: she is now a central agency for sale by Paul Alan. Built by Hong Kong's Supercraft in 1984, she exceeds Lloyds 100+A1 class in most areas and passed a Lloyds survey in June 2009. Van Triumph is built to a three compartment standard and also has a double hull with 1m separation in the area of the engine and control rooms. Each side of the double hull is further sub-divided into four compartments. Also, the wheelhouse and accommodation areas - sleeping 16 guests in eight staterooms - are bulletproof, having being built for areas where piracy remains a threat. This superyacht has an estimated range of 15,000 miles at 11 knots and her very large refrigeration areas allow for long voyages without the need for re-provisioning. 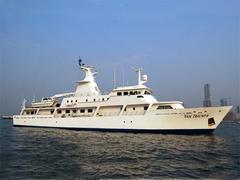 As Alan says, she could be described as the 'Hummer of the Seas,' and her asking price is $12 million.